In this module, you will learn about the 4 Essentials of risk enablement. Knowing about these Essentials is important because these are the things you need to think about to enable risk for the people you support. All of the 4 Essentials require you to be person centred. The person you support is at the heart of everything you do as a disability support worker. Being person centred is at the core of putting the 4 Essentials into practice. You need to know the person, their individual situation, their wants and desires. What is important to them? Spending time with the person and listening to their choices is a key part of the risk enablement process. Thinking about the people with cognitive disabilities that you support, you will understand that there is not a ‘one size fits all’ approach to being person centred​. Everyone’s needs are different. The more you know a person the better you will understand their preferences and enable them to take risks. Josh is excited about going on a trip to Newcastle, but just as the group is about to leave, he changes his mind about going. Why does Josh react in this way? Leon, Josh’s Disability Support worker, phones Pete to seek advice. Instead of making a phone call, what could Leon have done to further understand Josh’s choice? Thinking about the work you do, what are some of the ways in which you practice being person centred when supporting a person with cognitive disability? Examples have been provided for you. These are shown in Figure 4. In Figure 4 you will notice that the Essentials are located together in the circle. This shows you that, in practice, they all happen at the same time. Another way of looking at the 4 Essentials is shown in Figure 5. In this case, the figure shows that all of the Essentials are given the same amount of attention because each ball is the same size. To make the process of risk enablement work, you will need to think about how much attention you give each Essential at any time for the person you support. There will be times when you will need to give more attention to one Essential over others. This is normal, and a judgement that you need to make. But you must weigh up all of the Essentials before making any judgement. ​Figure 6 demonstrates one example of where more attention is given to some Essentials over others. The larger the ball, the more attention the Essential has been given. You will also find yourself needing to do this at times, depending upon the person you are supporting and the situation they are in. ​Risk enablement is a dynamic process. It is constantly changing, depending upon the situation and the person’s needs. When you focus on all of the Essentials at the same time the process will lead to better quality of life outcomes for the people you support. How could the 4 Essentials help you to enable risk for people with cognitive disabilities, so that they live more meaningful and engaged lives? ​Positive outcomes can come from taking risks. In module 1, you were introduced to the positive benefits of engaging in risk. Remember those feelings you experienced when you took a risk in your own life and it had a good outcome and how your feelings changed when you were not supported to take part in a risky activity? Putting Positives First is about supporting positive risk taking. This Essential is not about eliminating risk. ​When supporting an individual with cognitive disability, you need to remember the benefits they can achieve from engaging in supported risk taking. Attempting to avoid risk will create negative outcomes. Table 1 below shows some of the benefits you can get from putting positives first compared with what is achieved through trying to eliminate risk. What is Tom's "exciting news"? What could be the 'risk' in Tom's situation? Describe how Tom's dad demonstrates Putting Positives First when talking with Tom. Learn More: Go to extra Activity 3.2 "David's skateboard"
​When someone you support wants to participate in a risky activity, you need to spend some time working out how to make this happen. Saying ‘no’ can often be an immediate reaction, especially when at first you might not be sure how to make the activity happen. You might also need to provide support in a different way which could be unfamiliar to you and will take time to think about and plan. Let's see how we can make that work for you. ​This Essential encourages you to think about being positive. You need to think about your response and think ahead about making this activity occur so that the person can follow through on their preference. The choice to participate in activities involving risk belongs to the person you support and your task is to make their choices happen. Read about Gloria's scenario then answer the questions. ​Gloria is a 25 year-old woman with intellectual disability who likes trying out new sporting activities, keeping fit and meeting other people. She has low support needs. Gloria saw a documentary on television recently where people with intellectual disabilities were learning how to rock climb and she has been talking about it ever since. She is keen to get the activity booked as soon as possible. Identify all of the things that you would consider to be positive risks if Gloria were to go rock climbing. Identify all of the things that you would consider to be negative risks if Gloria were to go rock climbing. If you were Gloria’s disability support worker, how would you respond if you were being reactive? If you were Gloria’s disability support worker, how would you respond if you were being proactive? Thinking about the work you do, can you remember a time when you or someone you work with was reactive rather than proactive while supporting a person with intellectual disability to undertake an activity? Explain the scenario. What are your thoughts about this? ​Staying true to preferences means that you need to understand the preferences of the person you support and then act on those. What does this person who is in this position want? As a disability support worker, you will need to work closely with the person and others who know them well to further understand and explore the risk they want to undertake. Figure 7 helps to display how you can think about this Essential in your practice. 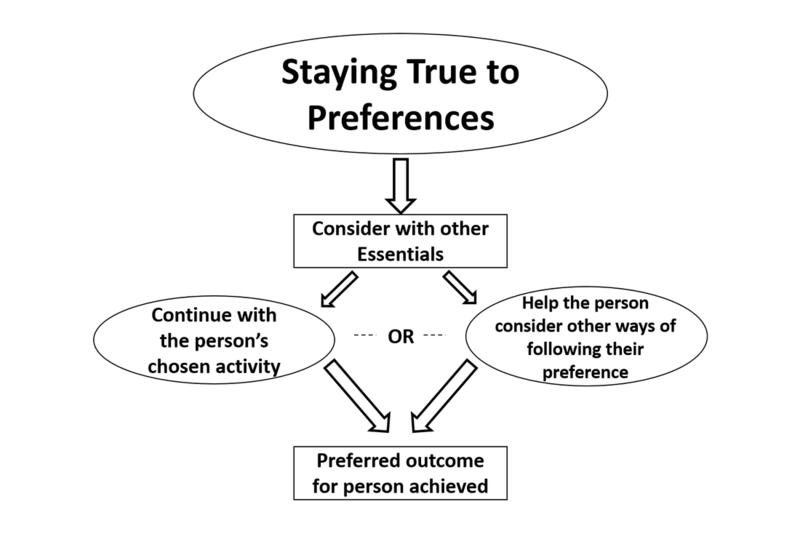 When you stay true to a person’s preferences, you maximise their choice and control. Why does Josh want a phone? What are considered to be the positive risks for Josh in this scenario? What are considered to be the negative risks for Josh in this scenario? Describe how Josh’s disability support worker goes about Staying True to Josh’s Preference while reshaping his choice. What could be the 'risk' in Dan's situation? Owen, one of the disability support workers, suggests an alternative activity for Dan. What is the alternative activity and how does Dan respond? Tony is the disability support worker who arrives to take over the afternoon shift. What does he suggest as a way forward so that they stay true to Dan's preference? Learn More: Go to extra activity 3.5 "Amanda wants to walk her dog"
Minimising harm while enabling a person with cognitive disability to take risks is an important balance you need to manage. Harm minimisation is not the same as harm elimination. Often, support workers explain that they find themselves giving more priority to reducing harm, but this approach is aversive and can prevent an individual from engaging in risk. You are Gemma’s support worker. Gemma wants to go swimming, but you say "no, it is the middle of winter, and you will catch a cold. Let’s stay inside and watch television today." ​Here, you focussed mostly on Minimising Harm rather than thinking about all of the Essentials at the same time. A risk averse approach was taken so risk was not enabled. Figure 8 shows what the Essentials can look like when more attention is given to Minimising Harm. Remember, risk also arises from avoidance. What risks do you think there were for Gemma from saying ‘no’ to her going swimming? (see Table 1 for some ideas). Tanya has been asked out on a date by someone she met at the gym and she is excited about going. What does her mum think is the 'risk' to Tanya in her situation? What things does Tanya's disability support worker ask her to think about as a way to minimise harm? Learn more: Go to extra activity 3.6 "susan's smoothie"
Enabling risk requires that you give your attention the 4 Essentials of Risk Enablement at the same time. Minimising harm cannot be your only focus.